Samsung uses the latest Lithium Ion battery technology giving you the best performance possible. Samsung batteries are designed to deliver 1000mAh the most reliable and long lasting power. 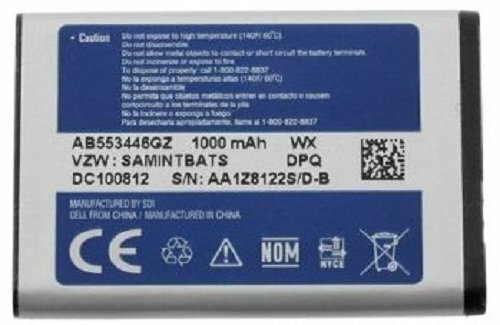 Part Numbers: AB553446GZ/AB553446GZB/AB553446GZBSTD The Samsung 1000mAh Standard Lithium Ion Battery, manufactured by Samsung is compatible with the Samsung A870, Samsung A930, Samsung A990, Samsung Knack U310, Samsung Haven U320, Samsung U340, Samsung Smooth U350, Samsung Gusto U360, Samsung Gusto 2 U365, Samsung U410, Samsung U430 and Samsung U620 phone models. Cables & Etc, LLC is the owner of the trademark C&E. This UPC is trademarked under C&E. Any violation will be reported to Amazon without any prior warning.Samsung batteries are designed to deliver 1000mAh the most reliable and long lasting power. Samsung uses the latest Lithium Ion battery technology giving you the best performance possible.